The Custom Molded 3D USB Drive, just introduced by ePrint123.com, is rocking the advertising premiums industry. These product and logo miniatures are head-and-shoulders above the traditional leave-behinds, guaranteed to be a conversation starter, and work as a great marketing tool to help businesses attract, impress, and retain clients. The Custom Shaped USB Drive mimics the shape, color, and texture of any product, and works just like a normal USB flash drive. It will be treasured by the recipient and is truly a gift that keeps on giving. Once in a while a product comes to life and disrupts the industry, making people wonder why someone hasn’t thought of it before. The custom shaped USB drive from ePrint123.com is one such product. It works just like any USB flash drive, with capacities ranging from 128MB to 64GB. It’s based on the latest high-speed memory chip technology and comes with a lifetime guarantee. It’s small, portable, and universally compatible with all desktop, laptop, tablet computers, and any device with a USB interface. The Custom Shaped 3D USB Drive offers something few other products can rival – it impresses the most demanding client, and is guaranteed to put a smile on their face. It’s made as a 3-dimensional miniature product, whether it’s car, a bottle of wine, or a jar of mayonnaise, complete with the shape, color, and even the texture, of the original product. The USB chip and connector is cleverly hidden inside the product, and in most cases are designed to encourage user interaction. While the process of making a proper 3D model and a custom mold is expensive, ePrint123’s unique workflow gets the design process down to a science, ensuring reliable output, and therefore can offer a lower price than most competitors. Priced at just $16.99 each with a minimum order quantity of 100 units, everything from 3D modeling, tooling, and production is included. Because it’s a very useful and functional gift, the recipient is likely to keep it and use it frequently for many years. Businesses no longer need to worry if their investment is being thrown away, giving it the very best ROI of any products in this category. The drive can be made with a wide variety of materials, including PVC, ABS plastic, wood, bamboo, metal, etc., to closely resemble the original product. By simply supplying a few photos to ePrint123, customers can take advantage of a turnkey solution that includes 3D modeling, custom tooling, production, and fast shipping. ePrint123’s turnaround time is among the fastest in the industry for such custom projects, often taking just three to four weeks from start to finish. The Custom Shaped USB Drive can be ordered online from http://www.eprint123.com/customusb . 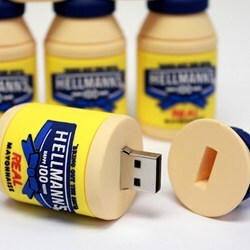 Also on this site is a catalog of over 400 existing USB drive styles which can be customized with quicker shipping. For a limited time only, the company is offering custom molded drives for a flat $100 fee over standard drives.